Readers need description to help them imagine the story world and to keep them grounded in the story, but often it’s considered the slow, boring part. Done right, description keeps the pace moving and brings out our point-of-view character’s emotions, backstory, and conflicts. It can also add subtext, foreshadow, and build on the theme. One of my favorite ways to bring description to life and make sure it serves a bigger purpose in the story is to use contrast. I’m excited Jami Gold has welcomed me back to her blog today to share how to make this work. I hope you’ll join me there to find out about the power of contrast in description. 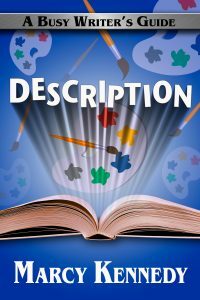 Want to know more about writing description? Description: A Busy Writer’s Guide is available from Amazon, Apple iBooks, Barnes & Noble, and Kobo. You can grab a copy in print or as an ebook. Description is often the unloved step-child of the writing craft. It’s undervalued and almost feared because writers tend to believe that things like dialogue and action are inherently better. We start to believe this because we associate dialogue and action with being active and interesting and we associate description with being static and boring. As a freelance fiction editor, I’ve more often seen people whose books lacked depth and emotion because they were dialogue heavy than I’ve seen people whose books were too slow due to excess description. Dialogue doesn’t necessarily make our stories better. Good dialogue does. Bad dialogue makes our writing slow and boring. Good description is vibrant, interesting, and active. Bad description is slow and boring. Bad description is what readers skip over. So what makes for boring description? Description should never be a simple list of objective facts. As long as we’re writing in first-person point of view or in a limited third-person point of view, description should be subjective, colored by our viewpoint character’s history, personality, and emotions. When we make our description serve multiple purposes, it becomes valuable to the story as a whole. If readers skip it, they’ll be missing something important. Purple prose is writing that’s too self-aware. It uses fancy words when a simple one would do, it’s filled with flowery phrases, it’s laden with cliches and clumsy figures of speech, and it relies on adverbs and adjectives when a strong verb or noun would be better. Purple prose can also be writing that’s there because the writer likes the sound of their own voice rather than because it serves one of the purposes I mentioned above. Description should happen only when the viewpoint character would naturally notice those things. So, for example, if our character is running through the woods to escape a gunman, he’s not going to notice the nest of baby birds or the squirrels hopping from tree to tree. He’s only going to notice things that could either help him hide or help him take down his pursuer. Much of the time, the feeling that prose is overwritten or boring comes from the writer describing things in detail that don’t need to be described at this particular point in time or which should have been described differently based on the situation. Showing is essential to strong description because it helps us be specific and bring the experience to life on the page. Telling: He was ugly and deformed. Showing: The skin on the right side of his face seemed to melt down like candle wax, and as he limped toward her, one leg dragged behind. Just remember that telling isn’t always a bad thing. It’s a tool like showing and we need to know how to use it strategically. Description, though, usually isn’t the place for it. Description: A Busy Writer’s Guide is now available! Are you looking for a way to add new depth and re-readability to your writing? Are you tired of description being “the boring part that people skip”? Are you a writer who’s struggled with making their story world feel believable and three-dimensional? Grab a copy of Description: A Busy Writer’s Guide at Amazon, Apple iBooks, Kobo, or Barnes & Noble. It’s available in print and ebook versions.